There is one stroke that causes more anguish, doubt, fear, frustration, teeth-gnashing, hair-pulling, and just plain misery than any other, and that is the hoop-running stroke. And yet it is the simplest of strokes — a single ball hit at an easy to moderate pace to a nearby target. Or, rather, it should be the simplest of strokes. One of the main reasons we fail easy hoop shots so often is that we overcomplicate this simple stroke. Sometimes we do this on purpose, attempting to apply one of the many tips and tricks that get passed from player to player like a bad cold. At other times it just seems to happen: we mean to play a normal swing, but then twitch, jab, poke, or lunge our way to a clank, stuff, or complete airball. To move past all this misery we need to dispel some myths about the mechanics of the swing and shot, and we need to learn to suppress those involuntary twitches, jabs, pokes, and lunges. First it will help to understand a bit about what happens to the ball after we strike it. 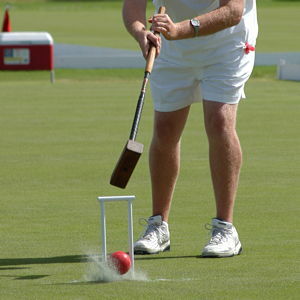 Unlike hitting a tennis ball or golf ball, when we hit a croquet ball neither it nor the mallet deforms much and the ball leaves the mallet face nearly instantaneously. The mallet itself does not impart spin to the ball. What makes the ball roll or spin is friction with the ground converting some of the ball’s forward motion into rotation. With an ordinary flat stroke the ball has to travel some distance before it is fully rolling. How far depends on how hard the ball is hit (a hard-hit ball needs more distance), as well as factors influencing the amount of friction between ball and grass, such as whether the grass is wet or dry. Hitting down on a ball briefly increases this friction, as the ball is driven against the ground. This gets the ball rotating more quickly, at least at first. Hitting down also tends to make the ball jump, though, and while the ball is airborne there is obviously no friction with the ground to further increase rotation. If you have ever seen a ball hit a hoop, bounce back, and then spin forward through the hoop, you know that forward rotation can be helpful in hoop-running. Even a gently-hit shot can be helped through by spin. When a ball hits a hoop its forward motion is slowed, stopped, or redirected, while its rotational motion is affected much less. If a ball is stopped suddenly its rotation becomes spin, causing friction with the grass and converting some of that rotation back into forward motion. I bore you with all this because one of the most persistent myths about hoop-running is that you should play the stroke so as to impart topspin to the ball. This is impossible, if we take “topspin” to mean forward rotation beyond that of a normally rolling ball. What you want is not topspin, but a ball that is rolling rather than skidding when it reaches the hoop. If the ball’s forward motion is substantially slowed by the hoop, the rotation may help it through. A ball hit gently will be rolling within a few inches. A hard-hit ball may hop and skid for several yards before it is fully rolling. For a typical hoop shot, a gentle to moderate pace ensures that the ball will be rolling by the time it reaches the hoop. So getting the ball rolling is good. But by far the most important factor in a hoop shot is hitting it in the right direction. If you alter your stroke to get the ball rolling sooner, you are no longer playing your most familiar and comfortable stroke, the one that gives you the best chance of hitting straight. And hitting straight is what hoop-running is all about. So not only is topspin in croquet a myth, it is a very destructive myth. It gets us trying things like hitting down, choking up, short backswing, exaggerated follow-through, all things that take us away from our most accurate stroke. For a shot that is straight or mildly angled, your best hoop-running stroke is your standard swing, the same one you’d use for a gentle-to-moderate roquet or touch shot. Slam! Don’t try this at home, folks. The exception is shots that are both short and very angled. Even a well-aimed shot will lose most of its forward momentum when it enters the jaws at such an angle. And because of the short distance, a normally-struck ball won’t be fully rolling in time, unless the shot is hit too gently to get it through even with spin. 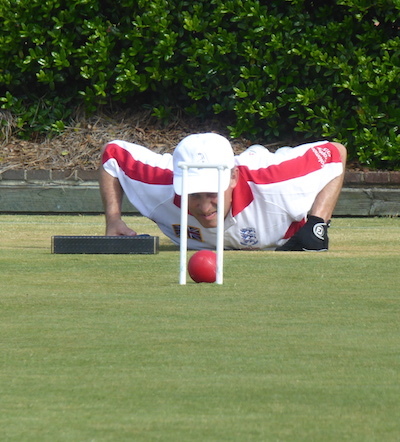 For very short, moderate-angle shots (a foot or less and around 30 degrees off line) one of the more reliable techniques is the “flick”, holding the mallet and striking the ball they way you would to play a two-thirds roll shot. For short, severely-angled shots (two feet or less and approaching 45 degrees) a jump shot is the best bet. But for anything else, most players will do best playing a normal stroke at an easy to moderate pace. Eyes closed: put a ball one foot in front of a hoop. Set up to run the hoop in your usual way, but before beginning the backswing, close your eyes. Keep them closed through the end of the follow-through. (You might be surprised at just how well you can play this way.) At the end of each stroke, think about the feeling of the stroke as you played it, and whether or not this feeling matched what you intended to play. Once you have run the hoop several times, move back to a foot and a half and repeat several more times. Then two feet, and so on, eventually back to around three feet. With your eyes closed you are forced to rely on visualization (otherwise known as “muscle memory”) to play the stroke, which is exactly what you should do even with your eyes open. Parallel shots: line up four balls a foot or so apart, so that the last one in the line is about a foot in front of a hoop. Play four parallel shots, aiming to hit the first three balls about three yards (pick a precise target for each shot) past the hoop. When you play the fourth shot, through the hoop, try to make the feeling of the swing match that of the other three shots. Repeat the cycle a couple of times, then move the balls back so that you are a foot and a half away from the hoop. This time play the first three shots about four yards, again matching the feeling of the hoop stroke to that of the first three swings. Repeat this a couple of times, then with distances of 5 yards / 2 feet, then 6 yards / 2.5 feet, then 7 yards / 3 feet. For all these sets, don’t worry about whether or not the ball runs the hoop; just focus on whether or not the swing feels the same with all four shots in the set. With both of these drills the goal is to get you thinking about the overall feeling of the swing and focusing on striking the ball cleanly. Once you have the shot lined up that is all you should think about.